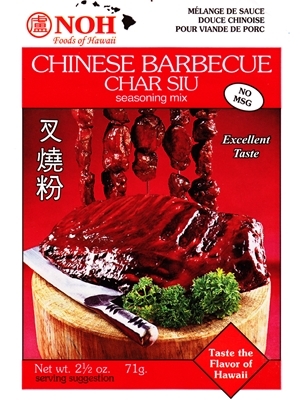 NOH Chinese Barbecue Char Siu Seasoning Mix taste the flavor or Hawaii. Add package of seasoning mix to 1/2 cup water. Mix thoroughly. Marinate 1 1/2 pounds of meat (pork or chicken) for a minimum of 4 hours; overnight is best. Preheat oven to 350 degrees. Place meat on a rack in a roasting pan and cook for 20 minutes. Turn meat over and cook another 20 minutes; or until done. Optional: Dry mix can be rubbed directly onto meat without adding water. Natural Cane Sugar, salt, powdered soy sauce (wheat, soybeans, salt, maltodextrin), 5-spice powder, (ginger,, ainseed, fennel, cinnamon, and cloves) onion powder, garlic powder, spices, red number 3.